Alumni News Management Society First Management Society Chapter Formed in Africa The Management Society extended its reach to Africa this spring with a chapter in Accra, Ghana. The newest members of the society are looking forward to creating change for Ghanaians by focusing on the Management Society’s mission to foster integrity in business. “Being the first chapter in Africa places a huge responsibility on our shoulders,” explains Seth Ayim, president of the new chapter. “We are pioneers leading Ghana and Africa in championing moral and ethical leadership. We come to the table determined to succeed.” The chapter came about through a serendipitous meeting between Ayim and Management Society steering committee member Chet Harmer at an LDSTech conference in Salt Lake City. Always ready to help other professionals, Harmer encouraged and supported Ayim throughout the process of forming a new chapter. “There is something unique about Seth,” Harmer says. “It takes a person who can catch the Management Society’s vision but also follow through. He is dependable, works hard, and gets results.” The Ghana Chapter has already solicited twenty members, including accountants, media professionals, and IT managers. To fulfill the Management Society’s goal of developing business leaders, the new chapter members are planning several events to benefit their area. The first is a quarterly career fair for Ghanaian college students. The new chapter plans on partnering with BYUIdaho Pathway Program to assist students with computer fundamentals, English, and basic math skills. The group also plans to encourage members to pursue professional development through graduate studies in Ghana and abroad by sponsoring scholarships. “They are embracing all the ideas of the Management Society,” says Rixa Oman, Management Society executive director. “Their excitement is inspiring.” The BYU Management Society links together managers, executives, lawyers, accountants, bankers, investors, and other professionals. With more than ninety chapters in twenty-five countries, the organization is committed to growing moral and ethical leadership around the world in addition to supporting BYU and promoting lifelong learning, service, and networking opportunities. 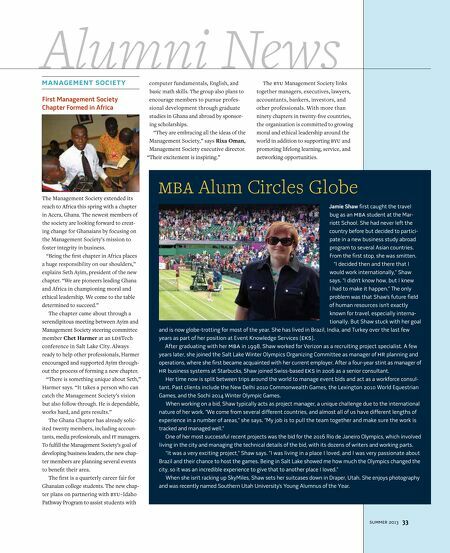 MBA Alum Circles Globe Jamie Shaw first caught the travel bug as an MBA student at the Marriott School. She had never left the country before but decided to participate in a new business study abroad program to several Asian countries. From the first stop, she was smitten. “I decided then and there that I would work internationally,” Shaw says. “I didn’t know how, but I knew I had to make it happen.” The only problem was that Shaw’s future field of human resources isn’t exactly known for travel, especially internationally. But Shaw stuck with her goal and is now globe-trotting for most of the year. She has lived in Brazil, India, and Turkey over the last few years as part of her position at Event Knowledge Services (EKS). After graduating with her MBA in 1998, Shaw worked for Verizon as a recruiting project specialist. A few years later, she joined the Salt Lake Winter Olympics Organizing Committee as manager of HR planning and operations, where she first became acquainted with her current employer. After a four-year stint as manager of HR business systems at Starbucks, Shaw joined Swiss-based EKS in 2006 as a senior consultant. Her time now is split between trips around the world to manage event bids and act as a workforce consultant. Past clients include the New Delhi 2010 Commonwealth Games, the Lexington 2010 World Equestrian Games, and the Sochi 2014 Winter Olympic Games. When working on a bid, Shaw typically acts as project manager, a unique challenge due to the international nature of her work. “We come from several different countries, and almost all of us have different lengths of experience in a number of areas,” she says. “My job is to pull the team together and make sure the work is tracked and managed well.” One of her most successful recent projects was the bid for the 2016 Rio de Janeiro Olympics, which involved living in the city and managing the technical details of the bid, with its dozens of writers and working parts. “It was a very exciting project,” Shaw says. “I was living in a place I loved, and I was very passionate about Brazil and their chance to host the games. Being in Salt Lake showed me how much the Olympics changed the city, so it was an incredible experience to give that to another place I loved.” When she isn’t racking up SkyMiles, Shaw sets her suitcases down in Draper, Utah. 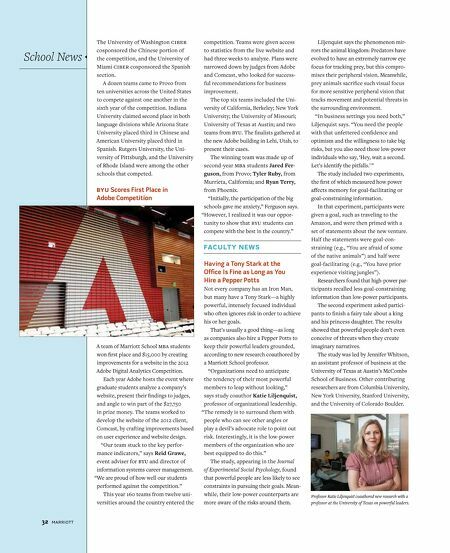 She enjoys photography and was recently named Southern Utah University’s Young Alumnus of the Year.